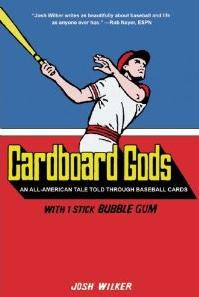 If you are reading this article or a regular visitor to the site, you will, in all likelihood identify with Josh Wilker and the esoteric musings contained within his book Cardboard Gods. An introspective autobiography that goes beyond the typical oratorical deliberations of a self-promoting book of this nature, instead Wilker uses the memories of his childhood baseball card collection to weave an, at times, convoluted look back at his, anything but normal upbringing. In all honesty, I would never read an autobiography about someone I don’t know, have never met, and in all likelihood, never will. However, this is far from an autobiography and despite being unfamiliar with the author prior to reading this manuscript, I feel a connection to Wilker that transcends the normal confines of traditional human interaction. You see, Josh is one of us, a collector and blogger- one that you, in fact, may be familiar with through his writing at http://www.cardboardgods.net/. He is a brilliant orator who has the capability of spinning a complete narrative from a single baseball card. Taking his blog to the next level was a natural progression for his entertaining writing talents. Published by Seven Footer Press and available nationwide next month. The book reads much like a blog with short anecdotal chapters focused on a specific card, from a specific year equating to a particular memory from Wilker’s childhood. The back cover defines the book brilliantly with this quote, “Cardboard Gods is more than just the story of a man who can’t let go of his past, it’s proof that- to paraphrase Jim Bouton (former MLB pitcher and author of the controversial title, Ball Four)- as children we grow up holding baseball cards but in the end we realize that it’s really the other way around.” These words ring true for me today more than 30 years since opening my first pack of baseball cards. Cardboard memories of simpler times when pick-up games of sandlot ball, Slurpees, the park district swimming pool and baseball cards defined not only summer, but childhood. A life-long, die-hard Red Sox fan, Wilker and his brother share a bond with millions of fans from Red Sox Nation. From childhood hero Carl Yastrzemski to vanquished Billy Buckner and to the triumphant titles of the last decade, Wilker intertwines his cardboard tales with yarns about life as a Boston fan and Yankees hater. However, readers need not worry that the book’s cardboard focus is weighted with any team biased or player collector slant. What really impressed me about this book is something in my own collecting habits I have, at times, taken for granted. Wilker’s careful attention to detail is thoroughly conveyed by the unique revelations of the often over-looked photo backgrounds, statistical and biographic data on the card’s back. Far from being a “can’t put it down page-turner”, Cardboard Gods is best read in doses, allowing, the often times, thought provoking revelations to permeate your subconscious. In so doing, you will find your mind exercising its memory recall with your own cardboard and childhood memories. Unlike most books that simply end, the story continues every day for Wilker and his followers, online, at http://www.cardboardgods.net/. PRP - me too. Sounds real interesting.